Posh striker Conor Washington shoots at goal against Crewe. Photo: Joe Dent/theposh.com. So the Peterborough United journey we were all invited to join is pretty much over for this season. It will be - barring point deductions for a few rivals or acts of God - a third straight season in League One for Posh after the battle between the division’s most out-of-form attack and the leakiest defence finished with honours even. The point from a 1-1 draw at the ABAX Stadium suited struggling Crewe and their 98 travelling supporters more than the home side and the visitors deserved to take something from the contest for their enterprise in the first-half and for withstanding a second-half battering without sustaining too much damage. Posh thoughts now - unless they can overturn a nine-point and 19-goal gap to the play-offs in three matches - will turn to the position of the manager and it’s impossible to not feel sympathy for Dave Robertson. He’s a passionate individual who deserves great credit for righting a sinking ship, but it will surprise many fans if he is not invited to return to his former post of Academy director early in May. Robertson achieved early success with a back-to-basics approach, particularly defensively. He’s also responded to demands for more flair and flamboyance by changing formations in an attempt to create more goal-scoring opportunities. Conor Washington did thump home the first Posh goal in over eight hours of football to rescue a point last night, but the club’s end-of-season golden goals production will not be a box set. Robertson found room for both his main playmakers Erhun Oztumer and Marcus Maddison last night. It was Maddison’s fierce strike at goal, pushed away by Crewe ‘keeper Paul Rachubka, that led to Washington’s equaliser midway through the second half and Oztumer waltzed away with yet another man-of-the-match award (presumably for his effort rather than his end product), but finishing the game with a £500k striker in Luke James playing as a right wing-back and a gangly centre-back Ricardo Santos as a centre forward was either innovative or smacking of desperation. Santos was sent on for the final few minutes, while specialist striker Aaron Mclean remained on the substitutes’ bench. It was a baffling end to a half in which Posh played pretty well. The energy, the defensive press and the passing tempo that was largely absent before the break returned to such strong effect there was always a sense that Crewe’s porous defence - they’d let in 71 goals before this game - would collapse. They didn’t as Washington rather ruined reaching the 10-goal milestone for the season by volleying wide a deflected cross from Oztumer before his goal and then prodding straight at Rachubka from eight yards after Joe Newell’s attempt at ball control turned into a terrific pass when it was 1-1. Crosses from Oztumer and Maddison flashed across goal at regular intervals. Harry Anderson converted one of them, but he was correctly judged to be offside and the officials were also spot on when Washington went down in the penalty area under a hefty chalenge from George Ray in the moments after his goal - the Posh striker’s habit of delaying his shot when well-placed again cost him dear. Crewe’s first-half display was described as ‘glittering’ by the club’s own Twitter timeline. 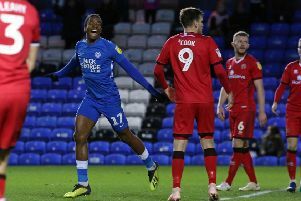 That was a slight exaggeration as was Robertson’s post-match claim that Posh were ‘magnificent’ after the break, but the Railwaymen did start the game with positive intent and they found great joy from the huge gaps that appeared between the Posh lines. Former Posh striker Nicky Ajose and Lauri Dalla Valle took full advantage in the third minute when combining for the latter to strike an unchallenged shot into the back of Ben Alnwick’s net from eight yards. Marcus Haber should have added a second goal with a free header in the 15th minute and Gaby Zakuani and Michael Smith both had to deliver crucial blocks to thwart Ajose in a period when Posh found it hard to clear their lines. Oztumer played too deep to influence matters before the break. He did curl one 20-yard shot onto the roof of the net, but otherwise Posh goal hopes appeared to rest on Maddison’s long-range shooting ability. He forced one low save from Rachubka in each half, but a far more involved display from the club’s most naturally gifted player was tarnished by the inaccuracy of his final ball or shot. Maddison poked a decent opportunity wide of goal when well-placed five minutes after Posh had drawn level. Michael Bostwick also tested Rachubka a couple of times from distance and Zakuani leapt well to meet a last-minute corner, but directed his header too close to the ‘keeper. Otherwise the quality of cross from the laft-hand side was pretty poor. The lethargy and the disjointed nature of the first-half display ultimately cost Posh a first win in five matches, but at least there weren’t too many Posh fans on hand to witness it. The lure of the Champions League on the TV or maybe the Wisbech/Peterborough Northern Star match 20 miles up the road had presumably helped to keep many fans away. That’s also what tends to happen when results and entertainment levels fall away. It’s now a big summer ahead for the Posh hierarchy. Posh: Ben Alnwick, Michael Smith, Kgosi Ntlhe, Jack Payne (sub David Norris, 35 mins), Michael Bostwick, Harry Anderson (sub Luke James, 73 mins), Joe Newell, Marcus Maddison, Erhun Oztumer (sub Ricardo Santos, 86 mins), Conor Washington. Unused substitutes: Dion-Henry Curtis, Aaron Mclean, Harry Beautyman, Shaun Brisley. Crewe: Paul Rachubka, Harry Davis, George Ray, Oliver Turton, Greg Leigh, Alan Tate (sub Jon Guthrie, 31 mins), Anthony Grant, James Jones, Lauri Dalla Valle, Nicky Ajose (sub George Cooper, 87 mins), Marcus Haber (sub Uche Ikpeazu, 77 mins), Unused substitutes: Liam Nolan, Anthony Stewart, Matt Tootle, Brad Inman. Posh - Washington (66 mins). Crewe: Dalla Valle (3 mins). Crewe - Grant (foul), Leigh (foul), Dalla Vella (foul), Guthrie (aggressive attitude).